Today I have teamed up with Nordstrom to talk about my go to Fall shoe. If you have been following my blog at all this Fall then it is obvious that my go to shoe for Fall has one hundred percent been over the knee boots. I can not stop wearing them. To me they are the perfect Fall and winter boot. My two favorite ways to wear them are either with a dress of some sort, mainly sweater dresses or with dark skinny jeans and a sweater, like today. I have invested in a couple of great pairs this Fall because I just get so much use out of them. Nordstrom, as you m ay know, is my favorite place to shop online and in store for shoes or boots and is where I have gotten almost all of my boots! They have the best selection and a price range that will fit everyone's budget. I have linked all of my favorite pairs of OTK boots below. These Louise Et Cie OTk boots are AMAZING! I really can not say enough good things about them. They really are comfortable. They are by far my favorite pair especially because of the color. Today's outfit is one of my favorites. It is simple and has all of my current favorite things. I feel like you can add a fun scarf to almost any outfit and it instantly changes it and makes it more fun. Love this casual outfit! 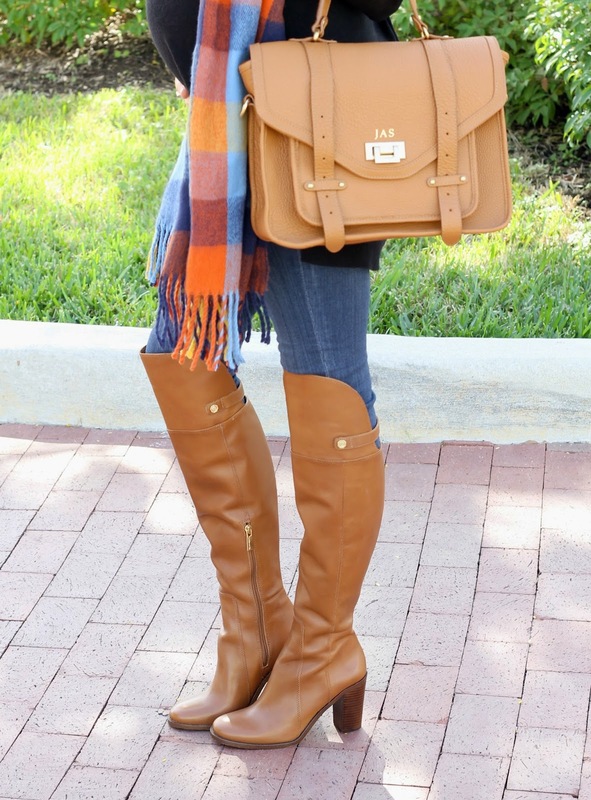 Perfect boots and scarf! Tots agree! Those OTK boots are obssess-worthy! Love this outfit looks perfect. Oh my goodness! Those boots are so gorgeous!! I love this look! 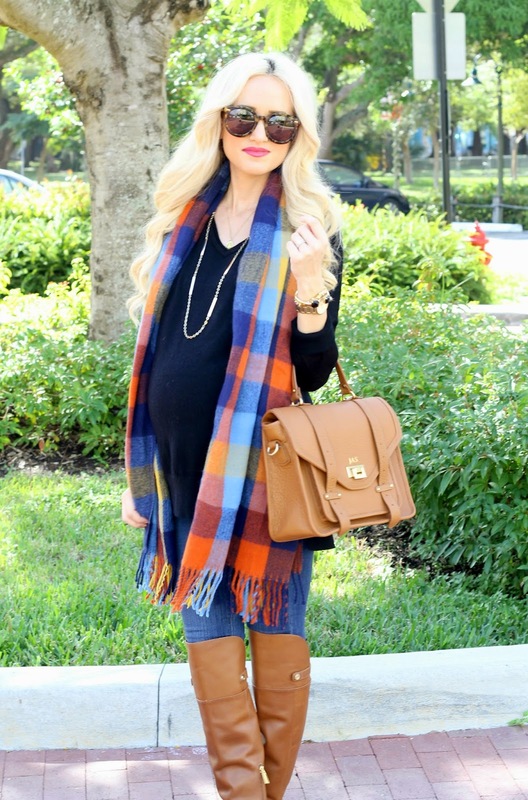 Those boots pair perfectly with the plaid scarf! over-the-knees boots have been my favorite this fall, as well, and I have loved seeing all of the different pairs you've worn so far this season! this pair, obviously, is no exception! Love this! OTK boots are my fave also! Oh I love the tan OTK! I am all about boots too. It's really nice to have multiple pairs because it's basically all I wear from September-March! Very cute style! You're the prettiest prego! Love your scarf! Such amazing boots and I love that bright scarf! Those boots!! They're gorgeous! I've been looking for a similar pair but haven't found the perfect ones yet. Always beautiful! Those boots, amazing! eeeeverything is great!!! So cosy & stylish!!! Love those OTK boots! Especially the color! You rock the OTK boots! I love the colors in this outfit! Great look and super comfortable and chic! In love with those boots.